Although you might want to do everything within your might to protect your children and to make sure that they grow up in a safe environment, unfortunately, there is only so much you can do. But, there is a lot you can do to childproof your home, and to make sure that your children never come in contact with anything dangerous or something that might be more threatening to them. But, make sure that you also explain to your children what and why you are doing it. Before you start panicking and losing your mind about just how much danger lies around your home, make sure that you first check it out. Even when you think that you secured something, there might be safety hazards which you need to pay special attention to. However, many of those dangerous spots or places can be easily avoided if you sit down and explain in detail to your children why it is a bad idea to go over there, or to touch something they should not. Your kitchen might the most dangerous place in your home to take care of, as it contains a lot of things you should careful put away and keep locked so that your children do not get to it. Moreover, make sure your children understand the dangers of playing with sharp knives and that they should never touch any chemicals without parental supervision. Put out emergency phone numbers on visible places, so that if anything happens, you or your children will be able to ask for help immediately. But, you should make sure that you show what your children should do in an emergency, so that they do not panic. You should ensure that your bathroom is safe and sound as well, not only by putting away dangerous chemicals, but also by installing anti-slip mats. Keep electrical devices out of reach, so that nothing could fall into water. Moreover, until your children are old enough to handle the faucets or showerheads, make sure to install anti-scalding devices as well, as these will prevent from burning their hands or even faces. After all, it is better to wait for the water to get hotter, than to suffer any injury in the meantime. In some homes though people will want to have a fireplace which is a nice addition and it can really improve the overall design, but it can be a very potential source of danger for your kids. However, with Blazing Glass’burner pits you can make it easy to handle, and secure for everyone in the family, as you will not have to wait for the flames to go out. Moreover, there are many safety features which will make it ideal for the whole family to enjoy without any worries. 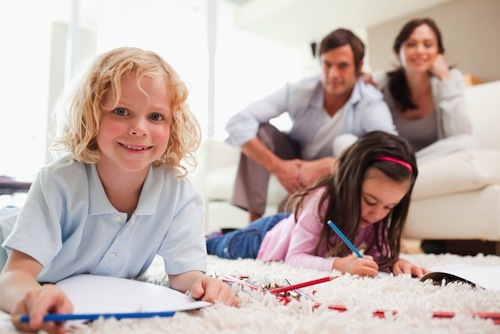 If you are unsure how to childproof a room, or if you need help to make sure that you have done everything in order to keep your children safe, it is always a good idea to hire a professional. On the other hand, be prepared for some extra expenses, but it will be a worthy investment as you will be able to keep your kids safe and sound around the house. Make sure to clarify why certain things are off-limits and why they should always ask before they do something with dangerous things. Even though there are many things you can do in every room, like covering outlets, you should always be prepared for the worst. Not mentally though, as it will eat you up, rather make sure that you are ready for anything so that you do not panic and that you can act quickly and without causing more damage. Furthermore, making sure that your children are clear with what is allowed and what is wrong in and around the house is also crucial, as it will give you a bit of relief. Prevention is the best medicine though, and it is an inevitable investment you will have to make. Do you want to know more about complete guide for a safe home? Check out these 101 Baby-proofing Tips! This is a must read for all with small children. Prevention is always better than regrets.